This is pretty much the easiest post I have written in quite some time. I realized that I have made things a little complicated lately…multiple steps, lots of ingredients…ALLTHELAYERS! Ain’t nobody got time for complicated. So what we’re doing today is making frosting. Plus, this is the fluffiest, easiest chocolate buttercream ever. And there are only 2 ingredients in there. 2 Ingredient Chocolate Buttercream? Yep. I talked about this frosting back on THIS POST. But I really felt like it deserved it’s own entire post, because well, it’s THAT good. So let’s talk Easy Chocolate Buttercream. Start with a bag of chocolate chips and 2 cups of butter. I know this seems excessive. But it’s buttercream…while it should be a food group, it isn’t. I’d like to think that using a good chocolate makes a huge difference, and while it certainly is good when using fancy chocolate, does it make a whole lotta difference? Not in my world. And melt over medium low until they are melted together. It will be remarkably thin. I mean, you use a whole pound of butter, remember? Now, let that set up. I stuck mine in the fridge until it was a solid block. I know it looks kind of gross..some of the butter separates to the top. It’s fine, though…I promise. I even flipped it over to show you that it really is a solid block. Let that come back up to room temperature and dump it into your mixing bowl. Beat that up for about 2 minutes on medium speed. Magically the color turns from dark brown to light brown. It goes from dense and thick to light and fluffy. As the frosting sits, the color will deepen, which is totally fine!! You need to go make this. Try it on top of my favorite Yummy Chocolate Cupcakes! 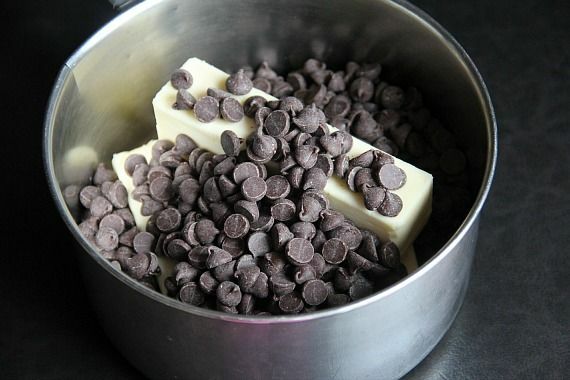 In medium saucepan, melt chocolate chips and butter over medium low heat, whisking frequently. When melted, cool completely and chill until solid. Remove from fridge and allow to come up to room temperature. Put all the chocolate in a mixing bowl and beat on medium for 2 minutes until light in color and fluffy. Makes enough frosting to filling and frost an 8″ layer cake, or frost 24 cupcakes. Store refrigerated, but allow to come back to room temperature before serving. I could eat this with a SPOON!!! It is sometimes the most simple things in life (aka – Chocolate and Butter) that can make a girl (or guy) happy!!! 1 package/ brick or however you get 450/454 grams of butter in your neighbourhood. Hy,can you tell me how in grams means two cups semi-sweet chocolate?Thank you! 350 grams in 2 cups. Easy to find info by googling or binging or yahooing or searching on your favorite browse. The recipe is in a 1 to 1 ratio so as long as you keep that ratio the frosting will work out so you go 500g of chocolate to 500g of butter you will be fine. Which should be equivalent to 2 cups in metric. Equal amounts by volume. 2 cups butter = 1 lb = 454 grams. 2 cups chocolate chips is 12 ounces, or 3/4 lb = 340 grams. Looks delish and perfect on the spoon. Do you have any experience on how it holds up? Does it keep its shape if piped on a cupcake or between layers of a cake? It definitely keep sit shape, I piped it on cupcakes and it was fantastic. I’ve frosted a cake with it, with no issues. Like I said, the color deepens the longer it sits, but that just makes it look more chocolaty! I honestly even left my cupcakes out at room temperature overnight without refrigeration with no issues at all! Could you substitute peanut butter chips for the chocolate chips for peanut butter buttercream? Haven’t tried it, but there are comments left here from people who have tried it and loved it! I substituted white choc chips and it worked well. Color was yellow after melting and went to white after beating. Whip butter in electric mixer until very light in color and fluffy. Scrape down bowl, add extracts and mix for a few more minutes. Add the powdered sugar 2 cups at a time, beating well between additions and scraping down bowl. Add the peanut butter, whip… taste… adjust the peanut butter if you’d like. Thanks for the chocolate buttercream recipe, I’m going to give it a whirl tonight! You could add a peanut butter powder like PB2 or Jiff powder to your icing to up the peanut butter flavor. Just beware that it tends to thicken the icing and you may have to thin it down. I was wondering if you could use margarine for this recipe as my husband is allergic to butter ? I don’t think that would work 🙁 sorry! Try using ghee. I’m allergic to dairy so I make my own ghee (aka clarified butter). It’s super easy and I think it tastes even better than butter. It’s basically cooked butter that is then filtered to get all of the milk proteins and lactose out. If he’s severely allergic and even the slightest bit of dairy could put him into anaphylactic shock, definitely not worth the risk, but if he’ll just suffer a little rash and GI upset, definitely worth finding out if he can tolerate ghee. It’s a life changer when you can put ghee on everything. I even bring a small jar with me so I don’t have to eat plain veggies when we’re out at restaurants, margarine is really bad for our health. I recommend staying away from it. Good luck! I have never tried that, so I can’t recommend it. You can use vegetable shortening, add a pinch of salt as well though. It won’t be the exact flavor because butter can’t be beat. 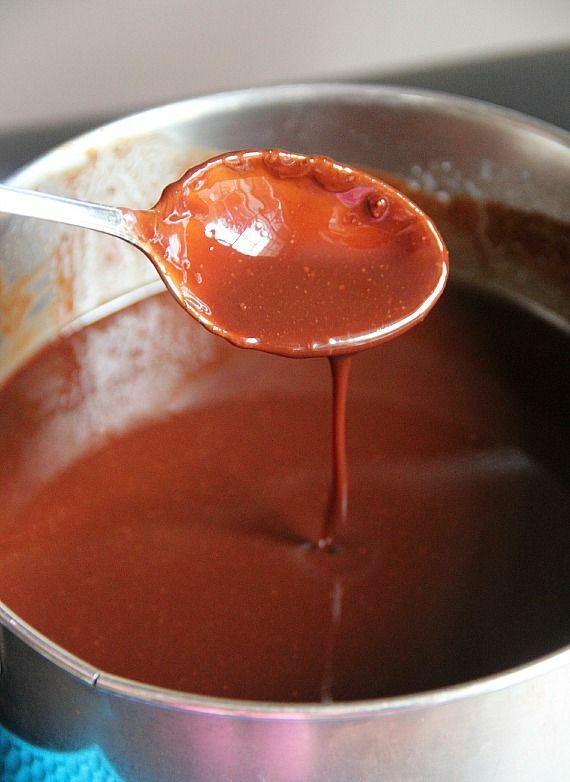 Melt chocolate first then add shortening to standing mixer wait until it cools completely and whip again. No. Unless you keep it chilled. Didn’t taste good. Butter overpower choc. Oh my gosh! This looks insanely perfect! YUM! I admit, I’m afraid of that much butter, but it looks so light and fluffy! Oh my! This sounds and looks insanely good! Wow! Awesome! Totally need to try that! This looks like one creamy, delicious buttercream! Pinning now! Hello, This looks amazing!! You’re talking to a ‘buttercream connoisseur’ – for the last 10 years since I was 7, my sister and I would make a little tub of buttercream and eat it in front of the TV before mum got home..! Haha. This recipe looks so delicious, definitely trying that tonight on the cakes I just baked! you DEFINITELY need to try it. and PLEASE let me know what you think! Can this be covered with fondant? Looks delicious! I am not so sure about that… I bet it would be fine, but it would need to set up for a few hours before you covered it! My thoughts exactly! What is this sorcery!? If this works for me I will never make another iceing! Thank You! I’ve never seen a technique like this before! This is pretty amazing. Out of curiosity, have you ever tried it using white chocolate chips? I’d assume it’d be the same result but wasn’t sure if the sugar/fat content would be off. Either way, this is absolutely on my Must Try list! Simply delicious. Super fast, love it! This buttercream looks amazingly good!! Wow! I definitely have to try this. I’ve done the Wilton Chocolate buttercream and all I have to say is YUCK. I like the vanilla version but there’s just something about adding cocoa to it that turns it nasty! Thanks so much for the post. My mom loves whipped type of frosting and she’s turned off by the chocolate wilton version too, so now I hope we have an alternative! Can I just say that I am THE WORST at making chocolate frosting. Whew confession! How nice not to have to worry about powdered sugar and whether you can get it stiff enough without making it sickeningly sweet! What a simple/wonderful recipe. I might eat it all before it makes it onto a cake though…. Love this. Can’t wait to try it! Have you tried other chips such as butterscotch etc? I haven’t yet, but a few people have asked me the same question and I think an experiment needs to be had! is the butter salted or unsalted?? I use salted, but you can use either! Do you know how many cupcakes this recipe will frost if you make a swirl on top of them? Thanks! I love easy frostings! This one looks so good! I tried a frosting one time that was just melted chocolate and sour cream, I was skeptical at first but it turned out to be so good! OH! I need that recipe! How cool! 11/2 cups sour cream, with the fridge chill off or even slightly warmed. 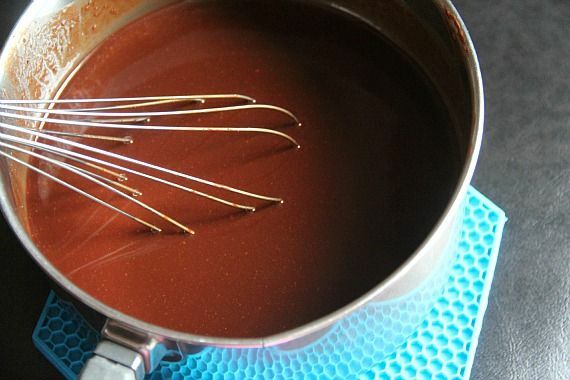 Melt the chocolate in microwave or in a double boiler. Stir in the other ingredients. Frost the cake. The miracle of this frosting is the texture while warm — it spreads like whipped cream. So easy and forgiving. Then, when it cools off, the chocolate firms the whole thing up to a texture like fudge. Perfect. Please don’t take this as an offence but I hate the fact that you need so much butter. You could have added honey instead. I have my own baking blog and I figured out that you can use cocoa powder, a little bit of butter, and honey to make amazing buttercream. You should try it. How much time does the frosting take to thicken in the refrigerator? And how long did it take to come to room temperature? Mine took a few hours to totally solid up. To come back to room temperature, about an hour. If it’s still a bit cold, it will still be fine 🙂 I’ve done it both ways and have gotten a smoother consistency when I let it come all the way back to room temperature , though! Hi Shelly, Super excited to try this. I don’t have that much time to solidify the chocolate in the fridge – is it a good idea to freeze it? Thanks! 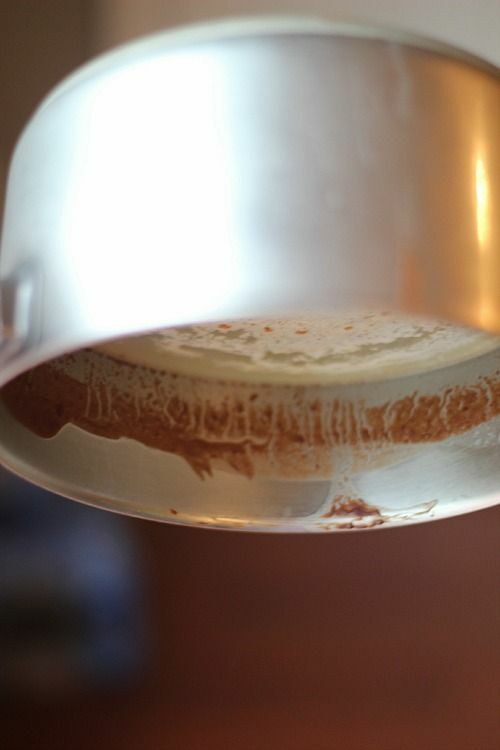 You can… just as long as you bring it back to room temperature before mixing! So, basically its chocolate butter? Totally brilliant. Do you use real butter? If so, does it matter if it’s salted or unsalted? And do you taste the butter really strong? Definitely going to have to try this! 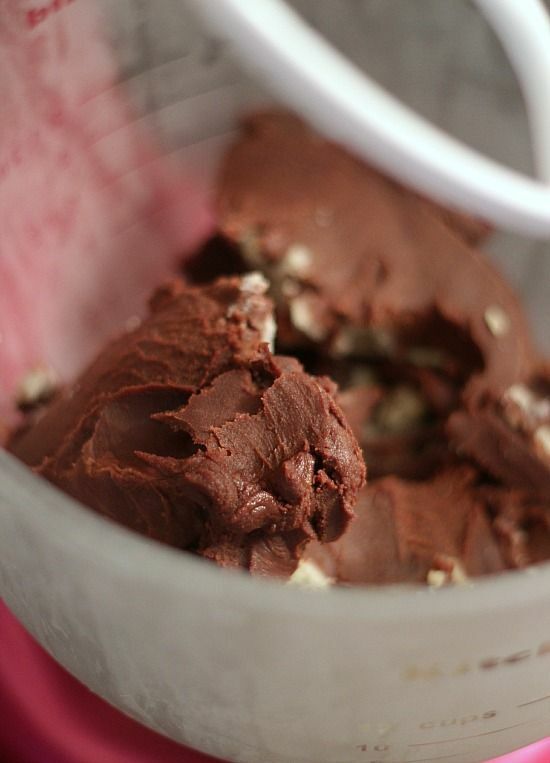 I’ve been looking for a chocolate buttercream recipe that I love. This may be it! Yes, real butter, and I used salted. The butter flavor isn’t really strong, actually. I thought it would be, but it’s not. I mean, clearly you taste that it has butter in it, but it’s kinda magic how it happens! This is so smart. I’m so trying it! Oh my god, how easy is this! I remember when you made this in an earlier post and I was in shock by how easy it was! I can’t wait for an occasion to make this! Would it be wrong to freeze it and call it ice cream? You are a genius. I LOVE this!! so easy it doesn’t seem like it could be real! This looks great! About how long did it take to harden? I usually leave it overnight, but you can do it the same day, just give it 3-4 hours! Have you ever added Peanut butter to this???? I can attest to the ease and deliciousness of this recipe. Loved it! Forget the cupcakes and cakes, I would eat bowl-fulls of this beautiful frosting! It looks amazing, Shelly! How is this so easy?!? And how have I never figured this out in all my years of buttercream consumption?! need in my life. I love magic recipes like this!!!! Can’t wait to try. I totally agree! Buttercream and all frostings deserve their own dessert category, in my opinion (: This chocolate buttercream looks so dreamily delicious; I’d love to try it out sometime! This frosting looks awesome! Love the simplicity of ingredients and all the chocolate. No need for excessive powdered sugar. I can’t wait to find the perfect vehicle for this frosting. I usually don’t like buttercream, but this looks amazing! I’m going to have to give it a try. My ultimate favorite frosting is ganache which is basically heavy cream and chocolate chips. I’m all about simplicity! OMG. this looks fantastic.. Super easy and love that you can keep it. You are really awesome. Wow. That looks so insanely easy and yummy. Can’t wait to try this recipe. This icing looks so absolutely delicious! I could literally eat it straight out of the bowl! This would never make it to the cupcake, I would eat it straight from the mixing bowl! Wow, this looks divine! I have never mastered frosting, as the powdered sugar always messes me up. I think I may be able to pull this off! Thanks for sharing! You are killing me…I have died looking at the pictures. I have been off sugar for 27 days f(or health reasons) and I really want to say screw it all!!!! Can you use honey? I make chocolate chunks using coconut oil, raw cacao and honey, warm just to melting stage and then cool. It makes a wonderful chocolate for all purposes. Honey in place of sugar? I tried this using milk chocolate chips and it tasted delicious but was REALLY soft – too soft for piping! Do u think it was because I used milk chocolate? I know when making ganache you use different ratios of chocolate: cream based on the type of chocolate (because of fat content) – I wondered if this may be the same? I will definitely try again with semi sweet because it was yummy!! I imagine that using the milk chocolate definitely played a part into it being a softer consistency. All in all it’s a soft frosting, but I have piped it on cupcakes in the past and it’s worked great! YUM! It looks so fluffy! LIke the Cool Whip frostings that look great but I won’t eat! :X Now this I would eat off of the spoon! Would you mind if I added a couple of cups of toasted pecans to that bowl! This is the most beautiful chocolate frosting ever! I’ll be coming back to this recipe…over and over again! your own preference, but I used salted. It doesn’t really crust, but it holds it shape! This is essentially a whipped ganache. I make it often. Works really well when I have to travel with a cake because it sets up quite firm when you refrigerate and softens by the time I have to serve it. You can also use it un-whipped to pour over cakes as long as you stir it frequently as it cools to prevent the separation. It will be a darker color, though. Seriously?? I have GOT to try this!! Does this icing “crust” so that it can be smoothed on a cake? Will the icing get as hard again after it is whipped like it did when in the fridge in the first place? It doesn’t really crust, no, but it gets slightly stiff. I need a good choc frosting in my recipe box… do people even have recipe boxes? So simple and with things I always have on the shelf. Sharing this one and wondering where it was last weekend when I was searching for a good frosting for my mil’s birthday cake????? Wow what a great easy recipe. I love the 2 ingredients. Two ingredients for buttercream? That is so brilliant! Totally trying this out! That looks luscious! AH-MAY-ZING! This is the most brilliant technique ever! This might be be my first attempt at butter-cream ever! I mean, why not? Its that easy. Thanks for sharing. I made this for my sister’s graduation party and while it was DELICIOUS it was very runny and I had trouble piping it. ): I’m sure it was my error, not the recipe so any ideas on what I might’ve done wrong? Well, it is a softer frosting, but it shouldn’t have been runny… did you let the chocolate and butter chill until it was solid? Did you use real butter, as opposed to margarine? Brilliant. I can’t wait to try this. So simple. Just a bit of planning ahead. I bet it’s perfectly chocolaty. 2 ingredients? Wow! This sounds waaaaaay easier and yummier than the last chocolate frosting I made with cocoa. So can you pass over that wooden spoon in that first photo? I really need to lick that off! Holy cow this was amazing! My 10 year old made this (with pb and chocolate chips), and it’s turned out great! It tastes like Reese’s pb cups in frosting form!!! Thanks for the awesome recipe. Checking in to say that I made a batch of this last night. And ate like half of it with no intentions of frosting a cake whatsoever. This is definitely a keeper. I wasn’t sure it would turn out for me but it did… I made sure that everything chilled until completely solid. This is now a go-to chocolate frosting for sure. Thanks so much for this recipe! OMG I’m so excited to try this icing,you are a genius!!! I’ve been trying different recipes to put on my son’s Coconut flour Birthday cake and with no success as I will not used anything artificial 🙂 He want’s red icing and I tried beets and raspberries but had no red only pink ;'( So I am now going to make your chocolate icing as I have only a week left and feel defeated!!! Why not try using White Chocolate chips and then adding red food coloring? Could you add food coloring to this recipe? Someone told me to start with a chocolate buttercream when making red frosting to reduce the amount of food coloring needed. And I’m all for that, because ick – food coloring can be too bitter. I haven’t ever, but if you do try, use a gel food coloring! Hi Shelly. Thank you for this amazing recipe. Could you please tell me which chocolate could I use instead of the chocolate chips, and how much do I need? We don’t have those widely available in Brasil, so I would have to use maybe a chocolate bar. Please advise. Thank you again. You could use any chocolate that has a higher percentage of cocao…like the chocolate candy melts won’t work so well! How would this work if I used cocoa powder and stevia? I’m really excited to try this out! Curious though, can you use other chips in place of chocolate (like white chocolate or butterscotch)? Thanks for sharing this recipe. I haven’t tried any other chips, but I can’t see why it wouldn’t work! Do you think it would work with 1/2 a bag of chocolate chips & 1 cup butter? I’m a huge frosting fan but I don’t eat cake, so I would eat this by itself. I feel like doing a full one would be to much to eat. Dear Shelly, will this work with white choco chips?..? I haven’t tried it! I think that’s next on my list! I don’t understand all the hype. The chilling and reheating process takes forever, then the final product is less than satisfactory. It does not just ‘magically’ get that light fluffy color, you have to add lots of powdered sugar and some vanilla to even get it taste half decent. I wouldn’t recommend it. Find another recipe. While the simplicity of this recipe may be tempting, taking the easy way out doesn’t produce the best product. Actually it does get that color. You should try the recipe. There is no powdered sugar in this recipe at all. Thanks! I’d like to suggest adding the time it takes for the chocolate to become solid into the actual recipe. I hadn’t read that part in the reviews till after my frosting didn’t turn out. I ended up putting it in the freezer and re-mixing it and seemed to work out okay. I piped them on to cupcakes a day ahead of time and it seemed to hold its shape. I am not a huge fan of chocolate but love white chocolate. Do you think this would work with a good quality white chocolate? Mine didn’t turn out fluffy. Not as runny as when it was melted but definitely not thick… What did I do wrong? Maybe I let it sit out too long before I whipped it? How strange… yes, maybe it was too warm when you tried to whip it? I’m not in the US so could you tell me how many grams of choc chips it would be. I’m thinking of trying it with a dark chocolate slab….? Such a good idea… I always feel ganache with cream is harder to set. This icing with butter has such a beautiful texture that holds its form on the cake for longer. Good stuff! That photo?? Stunning! I somehow missed this post the first time and just saw it on Pinterest. Swoon! This sounds pretty yummy.. Would this work with coconut oil? I’m dairy-free. I don’t think so because the butter adds a lot of flavor…but if you try it let me know! I make the same frosting using Baker’s brand white baking/dipping chocolate and a tiny bit of vanilla, its fantastic. I would like to check with you, how long will the frosting will able to hold up its shape after piping it on cupcakes? I would love to try this recipe. I am living in a warm climate country . My frosting held it’s shape completely for 2 days… If the climate is very warm, however, you might have an issue and need to keep it refrigerated. This looks beautiful and delicious, and the consistency was accurate to your description, but I found the frosting to be very disappointing flavor-wise. This was extremely bitter and otherwise tasteless. I tried to add some powdered sugar (even though it wasn’t part of the recipe) to try and sweeten it a bit but it didnt not help. I would not recommend this or make it again in the future. I just tried to make this for a nearly-last-minute birthday cake for a friend who cannot eat corn(starch/etc). I, too, was very disappointed! Semisweet is just too, too bitter for a frosting with just the two ingredients, especially when it’s supposed to be the sweetest part of the cake! The consistency was okay, but I agree that it was bitter and otherwise flavorless. Perhaps chip brand DOES matter? Generic semisweet did NOT cut it! If I tried again, I might use my favorite brand of milk chocolate chips, a little less butter, and a dash of vanilla. Perhaps this would work better for dark chocolate fans? I live in Hawaii and made this for my son’s birthday cake. I was nervous it wouldn’t work because it’s warm here, but it was superb! I did have to keep the cake in the refrigerator but it only needed to sit out for 20 minutes before serving. Having a diabetic son I was so happy to make a frosting that wasn’t full of sugar – Thank you for this easy and excellent recipe! This is genius! I don´t eat dairy so I used vegan margarine and it worked very well. Finally a vegan buttercream that isn´t too sweet. I wonder if this would work with Raw Cacao instead of chocolate chips? Pls can you tell me if the weight of 2 cups of choc chips in grams? and also if i could use cooking chocolate instead of chocolate chips, as chips are hard to get in my part of the world. 2 cups of chocolate chips works out to be 12 oz. And it looks like 12 oz is 340 grams. I wouldn’t recommend using cooking chocolate, but if that’s all you have it will be fine. It’s simply a taste preference for me! Hi Shelly, Cannot wait to try out this recipe. Have you used this frosting when using cupcake toppers made out of sugar paste? I have a project which this frosting would work brilliantly with! I haven’t tried that, but I imagine it would work perfectly! Looks amazing! Do you think this would work to frost a cake with before adding fondant? Yes, it does work for that. I beat this stuff for five solid minutes and it’s still chocolate syrup. Suggestions? Was it cold and solid when you started? The directions said to bring it up to room temperature, so it was kinda soft…. Does the recipe use unsalted or salted butter? I like more MILK CHOCOLATE, thats ok used this? I have never used milk chocolate.. it might not set up as stiff as semi-sweet, because milk is a bit softer, but I bet it would taste fantastic! 1 lb is the same 2 cups ??? and, Do You used unsalted or salted BUtter??? In butter, yes it is 2 cups. Also I used Salted, but that is only a matter of preference. Hey Danielle,where did you find sugar free chocolate chips? Can you add any vanilla to the recipe? Can I use Milk Chocolate? I prefer this. This looks too easy! I’ve been making buttercream for years & never thought of this! Do you think you could still add a cup of powdered sugar to this & it sets up the same? I’ll definitely be trying this out this weekend on my cupcakes! How many pounds or gr have 1 lb. Hey! So I actually made this for a cake. After falling the steps perfectly the frosting turned out looking great but it is pretty bitter! HELP!! Shelly, I just found this recipe. I thought it was interesting. But what impressed me most was the amount of time and effort you spent answering all the questions. You are truly a patient teacher. (and you didn’t burn Sam at the stake). Be still my heart…I’m in love! Worst frosting ever!!!!!! It was like eating a stick of butter on a cupcake. Gross will never do again waste of my time and money! I think it definitely seems like way too much butter…but I’m going to try this method for adding chocolate to my buttercream, just use my regular amount of butter and still add powdered sugar. I’ll report back. Sorry you had a bad experience. I made mine with salted butter and didn’t find it too salty at all. You could try making it with unsalted and adding a bit of salt back yourself. It isn’t a “typical” frosting, but I really like it! THanks! Wow!!! DELICIOUS! I just wanted to let you know that I took the 3-4 hour fridge step out of the process, in case it helps some of the viewers. I gently melted the chips alone until they were just barely melted and then poured it over the room temp butter (not warm though/slightly chilled) right into my mixer. I used a lightly salted butter for more flavor, but you could use unsalted and add a pinch of pink salt. It whipped up great and got lighter in color (whipped a minute or two) and I could have used it right away if needed. I was just a tad soft because it was not quite cold enough, which I expected, so I put the entire mixing bowl with the attachment in the fridge to chill a for 30 min and then gave it another quick whip before icing my cupcakes. I can’t stop eating it! It’s delicious and sweet without the cloyingly sweet taste you get with powdered sugar. I used Enjoy Life Mega Chucks semi-sweet chocolate. If I ever need a firmer texture for serious decorating, I can add a cup of powder sugar to the mix before whipping, but I LOVE the taste without it! could u add food coloring to this?! You could add an oil based food coloring, yes. Hi,,, the recipe really very easy but I notice there is no powdered sugar to sweetened the frosting? Is it possible I can add a powdered sugar on it? And how much? You could add powdered sugar if you wanted to… I like this frosting without it. It’s a very unique frosting… but if you would like to add powdered sugar start with adding one cup at a time until you reach the desired flavor! Omg! Just made this frosting and it’s ah-mazing! I added a little orange zest to frost an orange cake! Incredible. Thx for the recipe! How long does it need to set in fridge? I had mine over night and it doesn’t look like picture? Please help! I actually found it on ebay, the brand is Ovenex and it’s a vintage baking sheet! could you use this under fondant? Yes, you could! But allow it to set on the cake before covering in fondant. THIS IS FREAKING FANTASTIC. SO FLUFFY OH MY GOODNESS. AND PALEO TOO. I AM OFFICIALLY IN LOVE WITH THIS FROSTING. THANK YOU FOR ETERNITY. I tried this because of all the great reviews. Made it exactly per the recipe, including step by step. This was the grossest stuff ever. NOT sweet at all, tasted like chocolate butter. Period. I salvaged it by adding about a cup of powdered sugar and some almond extract. Now its just a lightly sweet sorta chocolaty buttercream. I used good chips, and good butter, thought I put the good stuff in, I’d get good stuff out. wrong.. my additions made it usable, but still sorta “eh” not chocolaty enough for the cake recipe I was using. SO sorry to hear you weren’t satisfied, but glad you were able to make it work to fit your taste with the addition of powdered sugar. Yes, the frosting is completely different than a traditional buttercream, I mentioned that in the post, and so I do understand that everyone may not love it. Thanks for your feedback! I found this recipe a couple months ago on Pinterest and I’ve been making a quarter batch every other week to just eat with a spoon over a few days… Not the healthiest idea, but probably the most delicious! Thank you for sharing! What are the chances of it surviving at room temperature for that long? I understand most buttercream can survive room temp for a few days but just wanted to make sure this could too. It will be fine at room temperature.. I can’t imagine carrying a cake on an airplane! You’re a brave woman!! If you frost a cake and then chill it, what is the consistency when you go to serve it at a party? Just allow it to come to room temp before serving! Hi Shelly, If don’t have a mixer, do you think it’ll whip up ok in a food processor? TIA. It looks like you are using a paddle-type attachment to beat the frosting. I don’t have a stand mixer and there isn’t that kind of attachment for my hand mixer. However my hand mixer does have a wire balloon whisk attachment (in addition to the normal mixing rods). Would that be an appropriate substitution? Or is there no hope for me and I should just buy a stand mixer already haha. Why does mine taste so bitter? I used semi sweet chips and butter and followed the recipe to a tee. I would imagine it was the type of chocolate…what brand did you use? Could this frosting be used to pipe “petals” onto a cake for decoration? Thanks. And it tastes yummy. Yep, it would work for that and as the frosting sets up it gets a firmer! This is very similar to what I have been doing for years. I have a favorite chocolate ganache recipe that I make – semisweet chocolate chips, butter, corn syrup, vanilla, cream. If I don’t use all of the ganache for other purposes, I will let it come to room temp and then I whip it up into a frosting. It has become my signature chocolate frosting. But your recipe sounds just as good, and very simple. Thanks! Shelly, can I use white chocolate for this recipe? This looks absolutely delicious and amazingly easy!!! I recently started experimenting with swapping out butter for coconut oil, it makes me wonder if it would turn out the same. I’ve had success with cookie recipes, I’ll let you know when I try this. Thanks for the great recipe!! I’m not so sure it would work with coconut oil because you would lose the butter flavor that you get, but if that wasn’t an issue for you it might be ok! If you try it let me know! Could you cover a cake with this like you do with ganache? Also if covering a cake would you be able to decorate with gum paste figures etc? You use it as you would any frosting! It will be great! I just made this and had my kids all excited to try it, but it came out BITTER. My kids actually spit it out 🙁 Can sugar or something be added? I am trying to salvage the chocolate and butter I put into it. You could certainly add sugar.. what kind of chocolate did you use? Semi sweet chips like it called for… Nestle brand. It’s just not very sweet… which would be better, regular sugar or powdered? If only I didn’t just go dairy-free! I’ll have to try this with coconut milk! what would happen if instead of firm up in fridge, it was immediately poured into KA mixing bowl sitting in an ice bath and the KA set to just whip away until ….. that’s the question, until what happens… thick and fluffy or ??? What is the weight of the chocolate? It just says 1 bag. I am in the uk and have various bags with different weights. Oh my god I am actually mindblown!! I made this tonight, looked just like your pictures (used salted butter and Tollhouse chocolate chips). It was very salty. Iced the chocolate cake, put it back in the fridge to set up. The icing still tasted salty. For me this was a disaster. Any advice? I would say that it would work better for you with unsalted butter. I like a little salty in mine, but that’s personal preference! How long does it take for this to become a solid block??? I have had mine in the fridge for about an hour maybe hour and a half and it’s still liquidy. I was making this for my FIL Bday tonight and it’s seemingly not going to be ready. Lol. I can attest to the fact that this recipe is one delicious miracle. I blogged about it (linking to you of course) and it was so worth it. I tried this today, couldn’t wait for the miracle of only 2 ingredients! I used good butter, and good chips …semisweet, which I agree with a prior poster that stated it was not sweet enough, it is not. I followed along with the post, and mine was picture perfect, worked like a charm. BUT the taste is what is disappointing. It tastes like a semisweet butter. I let it sit in the kitchen aid, as we eating dinner and when I got back to it, it had deflated, and ran back down the attachment. I tried chilling again, and re~whipping, but the original volume is lost. I don’t think it has anything to do with brand or flavor of chips, you are going to end up with exactly what you put in, chocolate butter. No magic. Just gross. One question – er, ah, could you please give me a calorie count for a tablespoon full? After frosting does the cake have to stay in the fridge all the time and just brought out for slicing? Would it work with white chocolate chips? Hi! Just wanted to know whether i could melt the chocolate/butter and refrigerate for a week prior before beating it? Or am i expected to whisk it on the day? Yep, it can be refrigerated until you’re ready to use it! Very quick question, after whipping up the frosting, can it be left in the refrigerator overnight? I’m making cupcakes for my best friend’s wedding and it’s a decorate your own cupcake bar so the frosting will be set out for guests. I plan on making the frosting the day before and want to make sure it won’t need to be whipped again with a mixer. It will need to be whipped again before spreading or piping. SO sorry! can I make this a day before and beat it the next day when I need it? Hey Shelly quik question, what chocolate brand and what butter brand do you use? For this recipe I used Challenge butter, but if Challenge isn’t available in your area, then I would recommend Land O Lakes…and for chocolate I used Guittard! I would assume you used salted butter.. you can easily try it with unsalted if you prefer!! How much is 1 bag of Chocolate chips? I’ve been to the grocery store and there are different size bags. Not sure which to get. But omg! I’m am so anxious to try this. It looks sooooo good! 1 bag is 2 cups. 5 stars in: texture, fluff, light, color, easy. 1 star in taste. Using the semisweet chocolate chips and salted butter, it was was just really bitter. I was dissapointed because looked so lovely and amazing. Because of everything else I love about it, I’m going to try the white chocolate version as those chips are so much sweeter, but not overly sweet. Maybe even a milk chocolate chip version. Hi, Shelly! I came across your frosting recipe the other day and was intrigued! So, I pretty much had to make an excuse to try it. 🙂 Just made it today. I halved the recipe, as I only needed to frost 12 cupcakes. Followed the directions to a T and I did get the fluffy, light, beautiful looking frosting as in the pictures above: super easy really, just needed some preplanning as it took me about 4 hours from start to finish. Maybe because I am used to the excessively sweet traditional buttercream frosting with tons of powdered sugar in it, I found this one on the bitter and somehow blander side. I added 1 tsp vanilla extract, to see if that would help the flavor a little. I guess it made some difference in terms of flavor but not in terms of sweetness (obviously). I am thinking maybe 1 cup or so of powdered sugar would solve this problem (for those of us who find this frosting lacking in this department). Or, I would try making it with milk chocolate chips or white chocolate. I am assuming that the frosting would be considerably sweeter then. Otherwise, I have to say, it came together so easily and piped so beautifully, it is definitely worth more tries and tweaking. Thank you, Shelly! I prefer Callebaut or Guittard, but Ghiradelli is great too! Could you make this using ghee? I wish I could answer this for you, but I have never tried it! This looks absolutely delicious and simple! If I’m short on time, could I cool this in the freezer instead of the fridge, or would that mess up the texture/consistency perhaps? OMGoodness – this may be an answer to my prayers! My DH is Type II diabetic and although it is easy to cook s/f for him, for years I have played around with trying to make a decent s/f icing of some sort. 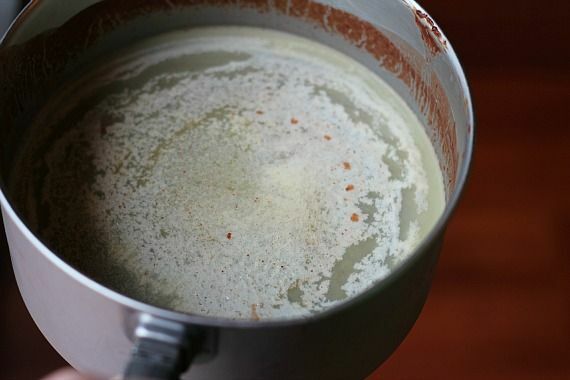 (The best I have done so far is whipping heavy cream and adding a large box of s/f pudding – it tastes fine and creamy but you can’t use it to pipe, etc). I have tried so many recipes not using confectioner sugar and nothing was ever right. Because he is Type II diabetic, he is supposed to eat low carb anyway (and mostly does – he is very good at this) – but on low carb (Atkins type diet), he can eat butter and chocolate (chips or block) with little to no consequences – so this chocolate icing is PERFECT for someone like him! A REAL frosting using no confectioners sugar – just amazing! I just made a huge batch of apple blondies which will be his dessert most of the week – but you can bet that the next dessert I make will be s/f cake of some kind but with THIS frosting on it! Oh now I am so excited that I can make him a great s/f cake and it can have actual frosting on it! Oh happy days! Thank you, thank you, thank you – I cannot wait to make this! (And because DH is Type II but eats low carb, I always keep 12-16 lbs of butter in one of my freezers (I stock up at Sams) – and who doesn’t keep good chocolate chips or blocks of chocolate in their freezer for baking? So voila! I don’t even need to go to the store! Oh now I am so excited about trying this ASAP! How long does it take for this to chill solid? I’ve had the melted butter and chips in the fridge for an hour and a half. What’s happened is the chocolate has sunk to the bottom and is more solid and the butter is “liquidy” on the top. Can you give me some guidance? Can I put it in the freezer to speed things up or will that wreck it? It might take up to 2 hours. It will happen, I promise! Have you used unsalted butter? I made this using homemade GAPS/Paleo Chocolate chips and a coconut oil ghee blend that I get from Green pastures. I didn’t actually make the chips this time, just melted the coconut oil and honey, then added cacao and blended, To that liquid mixture I added two cups of the ghee blend and let it melt, then chilled and treated as above. The frosting was amazing. It ended up tasting a little rich to us so I added a few drops of organic peppermint which gave it a great taste! So I just made this because I didn’t have any sugar to make normal frosting. It turned out really good! I put it on a yellow sheet cake. It is a little sweeter than I’m used to and next time I will cut 1/4 of it out (ended up with too much leftover!). Overall, I’m pretty happy though! I find it amusing that there’s an ad in the sidebar of this page for Plus Size clothing . . . hmmm. But throw caution to the wind – this recipe is easy peasy and delish! Tried this and loved it. Used unsalted butter, a splash of vanilla, and then added some salt so you could actually taste the salt (I was thinking about salted caramel or this dark chocolate w sea salt bar I like). It was so good and now I make this all the time! I always recommend a semi-sweet as it’s a little more stable…so if Toblerone is semi-sweet absolutely! But I would love to hear if you use a milk chocolate instead… it is just a tad softer due to the higher milk fat. But honestly I bet it would work! Excellent and easy. Tastes better than the cream inside a Lindt truffle!! Thanks so much!! Why chill it until solid? Why not just cool to room temperature and whip it in stand mixer until fluffy? Can you please give a carb count per serving. Ohhhhh this looks sooo good! I am definitely trying this ! Hi, if i bring this out lets say from the fridge for about 20 minutes, will it loose its consistency of fluffiness? If you refrigerate this frosting it will get very firm, so I never refrigerate it. NB: Don’t use salted butter – the saltedness of the chocolate chips is enough! Semi sweet choc chips means 50%fat? Are semi sweet choc 50%day? Do I use salted butter or unsalted butter. I use salted, but many prefer unsalted in this, as you can control the salt content and add more if necessary. I use salted, but it’s really a personal preference. In the picture ther are only two sticks of butter .the recipe calls for a lb. ? What kind of butter unsalted or salted ? Thank you for sharing your recipes. Can’t wait to try it. Can’t wait to try this, LOOKS ABSOLUTELY FAB !!!!!! Made it but didn’t like the flavor, had to add sugar just to make it not bitter!! What kind of chocolate chIPs sweet our semi sweet ? Butter salted or unsalted ? Semi-sweet will be marked on the outside of the chocolate chip bag. It is the typical chip that you use for chocolate chip cookies. I use salted butter, but it’s a personal preference. Did you use real butter? Salt or no-salt? I used salted, but it’s a personal preference! 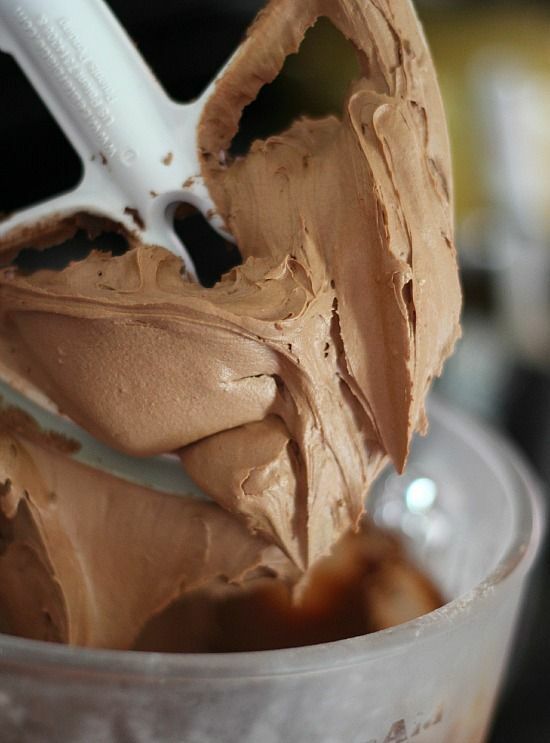 This looks like the most delicious way to make chocolate frosting!! Ok! So I would like to try this for my daughter’s birthday cake on Saturday! But I dont have chocolate chips. Can I use a normal chocolate bar? Or a combination of bitter chocolate with normal chocolate? why are there 2 ads in the middle of your 1 min video post? I love your recipe, but for 1 min 2 ads? After whipping the chocolate buttercream concoction and icing the cake, does it need to stay in fridge? Does this hold up under fondant? It will hold up as long as the temperature is not too warm where you store it! Since I buy chocolate chips in bulk, how many ounces are used? This recipe looks delicious and would love to try it. Disappointed in the taste. Very greasy. Not sweet enough. I made this and it ended up bitter. Where did I go wrong? I did use mini chocolate chips because that’s what I had. Too much chocolate? Yes, absolutely! You can use any type of chocolate! is this stable mam ? How can this icing be sweet with/no sugar of any kind?? The chocolate has sugar in it 🙂 It isn’t an overly sweet frosting, so you could add some powdered sugar if you would like to make it sweeter! Do you think this would work under a mirror glaze? Do you have to store them in the fridge? Or can I leave them sealed up on the counter top until i serve them? As long as you’re not in a warm climate they should be fine airtight at room temperature! You don’t need sugar to make it swet? the chocolate chips add the sweetness, but you can add some powdered sugar to make it sweeter if you prefer. This is a simple Whipped Ganache. This looked good so I made it. It’s gross. Don’t waste your time and money. I love buttercream frosting…this is not it. It tastes like what it is…chocolate butter. I put it into puff pastry cause I thought the butter would melt into the pastry and would be okay but nope. Still gross. I made this exactly like the recipe and it tasted like pure butter. No trace of chocolate….just butter. Can you use dark chocolate chips? use salted, but it’s a personal preference! I plan on trying this recipe with the white chocolate chips and colourant for a rose piped sponge cake 8″ round (approx 3 sponges high (2″ per layer). Could you tell me if the quantities listed in the recipe above would cover a cake if this size please? I made thi,and it is wonderful ! Does it work if you double the recipe? I have never doubled the recipe, but I see no reason that it wouldn’t. Would this work with white chocolate? Can you add strawberry flavoring and coloring to it. I just made this recipe, and it totally improved with a pound and half of powered sugar. If you are going to try this I would cut recipe in half to avoid waste. I tried this and it was exactly as easy as it looked. However I used semisweet chips and my kids said it was too bitter. I should have used milk chocolate for more sweetness but it was so easy to make. Thanks for the ease of it. Hi is it milk chocolate or dark chocolate u use for this recipe ! About how long does it take to get solid? In the refrigerator it usually takes mine about 1 1/2 to 2 hours. Help….mine turned out bitter!!! Why? ? Woooow!!! This recipe is epic. Will it work the same if i substitute chocolate chips with chocolate bars? For eg: a dairy milk bar. If so how many cups of that will i need? I’m wondering if it would be better with unsalted butter or maybe half salted and half unsalted. Mine seems a bit more salty than I like, but absolutely LOVE the ease of this recipe. Thank you so much! I made this with milk chocolate chips and salted butter and it’s SOOOO salty!! I normally use salted butter in my buttercream. Anyone else had this happen? If it’s too warm it will definitely get soft, but it does hold shape really well! How does this freeze on cupcakes? after a cake or cupcake is frosted, does it freeze well? Not very good. Wasted a bag of Guittard chips. Odd texture, too much butter gave us an upset stomach. The butter should be salted or unsalted? Plz do reply as I need to try out this recipe! Thanks! I wanted to add a pinch of sweet because I felt it needed a bit. I had a brain fart and used granulated sugar instead of powdered sugar and now its gritty. ANy recommendations to fix it or am I fresh out of luck??! Does it make a difference if you use milk chocolate chips instead of semi sweet? Hiiii what it hurt to add just a tinge of vanilla and maybe just a little more sweeter of some kind?? not much… just a little!! It wouldn’t hurt to add vanilla of course. And some people have added powdered sugar. You could also use milk chocolate, which is a sweeter chocolate! Thank you Shelly!!! After i frosted my cake, i found i did NOT NEED TO ADD ANYTHING ELSE!! Sooo delicious!! I thank you from the bottom of my heart for this easy delicious recipe! I am so grateful to have found this since I am like so many others that hated trying to make frosting work!! Sheer genius on your part thank you !!! This stuff is amazing. Perfect for my “Dark as Sin” cupcakes. Everyone at work wants the recipe but it’s our little secret. Hi Shelly! I loved your Swiss Meringue Buttercream (http://cookiesandcups.com/fancy-frosting/) and was wondering if I could do the same technique you have here (melting chocolate and butter and letting them cool) to make a chocolate version Swiss Meringue? Many thanks! I just wanted to say THANKS so much for this recipe. I just made it to frost a Hot Chocolate Cake, and it was so light, airy, not too sweet and it even held up in the high heat and humidity here. This was a frosting that almost didn’t happen!I had stuck the melted choc and butter in the fridge and realized I only had less than 2 hours to go, panicked thinking I had to make another frosting, then decided to put the bowl over another bowl with ice in it and stick it in the freezer. 20 mins later it was hard, thank god, but when I mixed it up there were some bits inside that had not hardened. Panic again. However after some mixing it all became hard. I almost couldn’t believe my eyes as it was whipping in the mixer, it went so light in color and extra extra fluffy in texture. Disaster averted! Lol I had never felt so relieved. Thanks again! Is it regular butter or unsalted butter? I use salted, but it’s a personal preference! If you use unsalted you might want to add a pinch to enhance the chocolate flavor!